The 50 Dragons slot game from Aristocrat is speculated to be an exact replica of the 50 lions slot game. 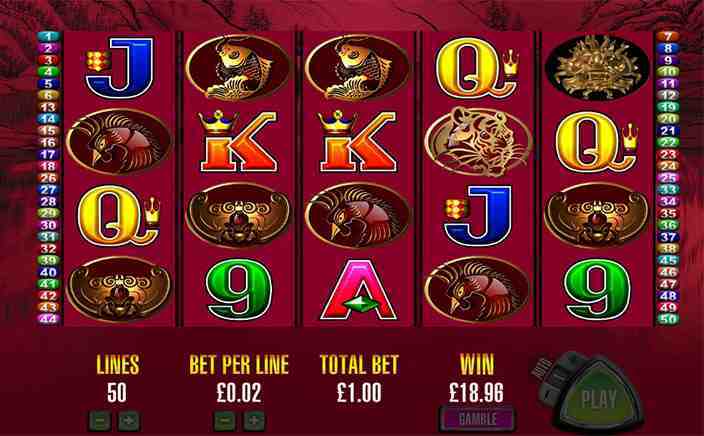 This oriental slot game however makes use of a more ferocious icon to represent it. The background of the game is consistent with that of a Chinese background with an oriental landscape. The color red has been used predominantly and all the symbols in the game have been designed to be made of stacks of gold. As you enter into spinning, the whole background takes shades of red and gives a dark but promising atmosphere. The game has a number of symbols which include the conventional deck of cards and other symbols like golden ingots, pearls and even the dragon. 50 Dragons is a 5 reel, 4 row and 50 paylines slot game. The stakes can be adjusted right from 1p per payline making the minimum limit of the game just 50p per spin. This way even people who aren’t emperors can get a chance to win in this slot game. The game has a number of fun features that makes it pretty addictive if you are a fan of oriental games. The best part about the game is that it follows conventional progression and gameplay, which means you need only very little test spins to get a feel of the game. 50 Dragons mainly relies on 3 symbols to make the game rewarding. The first symbol of significance is the golden dragon. This is the highest paying symbol in the game. Landing this on a winning payline makes the dragon come alive and give an earth shattering mighty roar. The game jackpot which is 50x your stake is achieved when you get the dragons to fill all slots in the game screen. The magnitude of the roar can only be left to imagination. The pearl symbol is the wild in the game. It only appears on reels 2, 3, 4, 5. The wild in the game is a symbol substituting wild and can work its magic on all symbols except for the scatter. The scatter symbol is the golden ingot. Tony triggers the free spins bonus game. Getting 3 scatter symbols wins you 10 free spins in the game. Getting 3 more during this round can further enhance the number of free spins by 5. 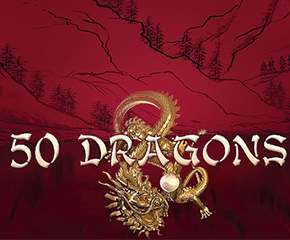 50 Dragons is a great oriental game from Aristocrat. The graphics and sound effects are pretty astounding, and the game maker has gone to great lengths to ensure the game presentation is too. The game could have used a better jackpot, but the features in the game are a good attempt to make up for it.